Don’t Be Tardy star, Kim Zolciak, is not shy when it comes to sharing pictures of her physique on social media. She has even been accused of having more plastic surgery done then what she’s already admitted to. Well, in a clear case of “do as I say, not as I do,” Kim is in the awkward position of having to explain to her daughter, Brielle Biermann, why plastic surgery may not be the best option. At least for the time being. Kim Zolciak has never been shy about drawing attention to herself. Posting endless selfies and teasing about her latest cosmetic procedures. The Don’t Be Tardy star clearly enjoys being the center of the universe. And she loves showing off how she spends her hard earned money. From rolling with Rolls Royces to posing with her Speedo-clad hubby Kroy Biermann on a private beach, Kim seems to be living the good life. At least according to her social media. Now, Kim is receiving some attention she would probably rather not have. She has been accused of being unfashionably late on a credit card bill. To the tune of six digits. 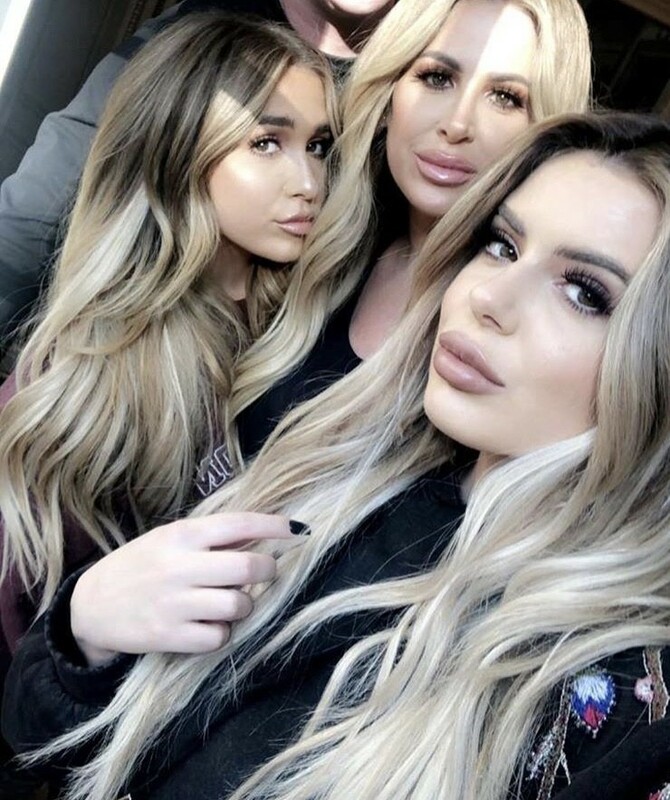 Somewhere in Atlanta is a very wealthy and very busy plastic surgeon courtesy of Kim Zolciak and Brielle Biermann. The burning question we all ask is: is anything real with these two? And if this picture is any indication, it looks like younger daughter Ariana Biermann could be following in her mother’s and older sister’s plastic footprints. It’s hard to remember that Kim Zolciak and Kandi Burruss used to make music together . Think back to the early days of Real Housewives of Atlanta. That music includes a little tune called “Tardy for the Party.” That song was catchy enough to inspire the name of the first RHOA spin-off: Don’t Be Tardy. That was before stolen baby names. And, of course, it was before a lawsuit for unpaid compensation came between them. It feels like the saga between Kim Zolciak and NeNe Leakes will never end. During Season 1 of Real Housewives of Atlanta, these two were best friends. For a couple episodes anyway. Then, they had an on-again-off-again relationship that spawned some infamous insults. NeNe told Kim “close your legs to married men.” She called her a “trash box.” NeNe even referred to Kim as “Wig” instead of her actual name. Many times over. And who can forget their confrontation during the Season 10 reunion? There’s no coming back from that kind of animosity. Right? Well, you never know what to expect from these two. The door is actually not closed. Andy Cohen’s baby shower last month was an event of epic proportions and was packed with Real Housewives. Unfortunately, there were some OG’s missing. Real Housewives of Atlanta star, Kim Zolciak did not attend. The baby bash was hosted by the Real Housewives OG’s, NeNe Leakes, Vicki Gunvalson, Ramona Singer, Teresa Giudice, and Kyle Richards. Why wasn’t Kim at the party? Did she just blow it off? Furthermore, did they even invite her? Oh, Kim Zolciak…neither Don’t Be Tardy nor Big Papa nor John Legend will keep the drama away from you, girl! Even when Kim tries to launch a family business, she runs into drama. What did she do this time? She posted a photo to advertising her makeup line wearing makeup that’s not even from her line. How did anyone put this together? She decided to promote the line with a photo she posted before the makeup even existed. This is certainly one way to get some publicity for her new lip kit line, KAB Cosmetics. Don’t Be Tardy’s Brielle Biermann is such a fascinating creature. Brielle and her countless lip injections existed before Don’t Be Tardy, but she’s a whole new person now. She’s been on display her entire life like a reality TV mannequin. Having a front seat to her life means that we get an inside look at her relationships. We thought for sure that Michael Kopech was the one for her because relationships and reality TV always work. Brielle’s mother Kim Zolciak found love with Kroy Biermann, so why couldn’t the same happen for her? We had high hopes for Brielle and Michael, but alas it wasn’t meant to be. Unfortunately like a plastic surgery botch, some things just don’t go as planned. Relationships and John Legend tickets come and go. It’s hard not to think of all the possibilities that could have come from their relationship. Who wouldn’t want to watch a spin-off of Kim’s clone and her baseball boyfriend? *Crickets*. The real question is why broke up. What went down that led to the end of the end of this millennial love story?